When we woke up, Tim (Alex’s brother) and I went down to the pier to fish for a while. We didn’t catch anything but had fun. In the morning, Jozef Sobzcak made pancakes, sausage, and hashbrowns for his First class requirements. After breakfast, Alex and I did devotions and we passed out song sheets while Mr. Mades played some songs on his guitar. After that, we used floor lashings to build a raft and some people got the lashings requirements done. At around 9:00, everybody went down to the tennis courts to play basketball, football, and tennis. Will, Danny, Alex, and I played PIG while some of the older scouts played tennis. We also checked out the pool and Will hopped in and got drenched by the cold water. We decided to go back to camp to eat lunch after playing in the sand. The Madeses and the Sorrells had pizza while everybody at the main camp had sandwiches. Jozef also made some ham and cheese wraps for his requirement. After lunch, the Niles, Madeses, Sorrells, and Meyers all went ziplining at some place nearby. Eli, Will, the Sobczaks and us, the Clarks all went to the beach. We played football, had sand fights, dug big holes in the sand, and invented a new game called 3-point. In 3-point, everybody starts out with 3 lives. When you throw a bad pass (with a ball) or miss a catch, you lose a life. The last person standing wins. After a couple hours, everybody from ziplining arrived at the beach right as Eli, Will, and I were leaving. While the zipliners stayed at the beach, we took showers and played some football at camp. When everybody got back at camp, we had some good dinner. The Clarks had steak and potatoes while the Meyers made burgers and hotdogs. Jozef cooked spaghetti with hand-made meatballs. His stove had many failures but after 3 hours, he made some really good spaghetti and almost everyone had a sample. After dinner, we had a campfire and sang some songs with Mr. Mades. After that, Eli took some scouts near the bath-house to play some Escape the Spotlight. In the morning of Monday, we ate leftover mountain-man, sausage and pancakes. Some people ate cereal and Mrs. Sobczak cooked some bacon for everybody which was really nice of her. After breakfast, everyone went down to the beach all together. We dug holes, played more 3-point and football and searched the ocean floor. Eli used a butterfly net to catch a stingray, crab, and a jellyfish (not all at once though). Most of us ate sandwiches at the beach at the bath-house except for the Sobczaks, Meyers, Mades, and Sorrells. After lunch, most of the scouts stayed at the beach but Mr. Clark took me, Will Rice, and Alex to the pool, where we played tag, King of the Hill, and relaxed. My dad brought us some snacks and drinks while everybody else stayed at the beach. We went back to camp at around 4:00 and we took some showers. We played some more football and Will realized he “lost” his wallet. Mr. Sorrell took Will to Lulu’s to look for the wallet while Eli and the Clarks went to get pizza at a place called Rotolo’s. I got spaghetti, my parents got a pizza, and my sister got a pizza too. Eli got a large pizza and he brought leftovers back for Will. We also got breadsticks and buffalo wings as appetizers. When we got back to camp, Will hadn’t found his wallet and we played a lot of chess. The Sobczaks and the Meyer’s both left before Tuesday. Alex beat everybody at chess except for my dad who even gave Alex the queen to start off. On Tuesday, we all woke up at about 6:00 and ate omelets and cereal. We arrived at the fishing place at around 7:00 and waited for the boat to be ready. The boat took about an hour to get the 11 miles out into the Gulf. We saw lots of jellyfish and some dolphins on the way out. When the boat dropped the anchor, it swayed a lot and some of us, including me, got seasick. Those of us in the bow of the ship got really wet but also caught the most fish. We all caught about 3 fish each and Will caught a 25 pound barracuda. After the fishing part was done and the boat headed back to shore, the waves calmed down a lot and the sun came out. Mr. Sorrell gave us motion sickness pills and we all felt better. Will showed everybody the barracuda and we saw more jellyfish on the way back to the docks. They cut everybody’s fish and we put Will’s barracuda bits all in his cooler. After that, we drove back to camp and the Clarks and the two Rices started packing. We took down our family tent and Will got his tent down but we had to wait because Eli spent about half the time texting his girlfriend. Eventually, we all packed into the car and we stopped at a Five Guy’s which had some really good burgers. After that, we all took naps until around 10:00, when Mr. Rice came to pick up Will and Eli at the parking lot in Walmart. The Madeses, Sorrells, and Niles all stayed until Wednesday and I think they went to the beach one more time but I’m not quite sure because I wasn’t there. Fall is nearly here and our troop has many fun activities coming up to keep you busy! On September 12, there will be a Webelos Challenge day at Ditto Landing and on the 25th. 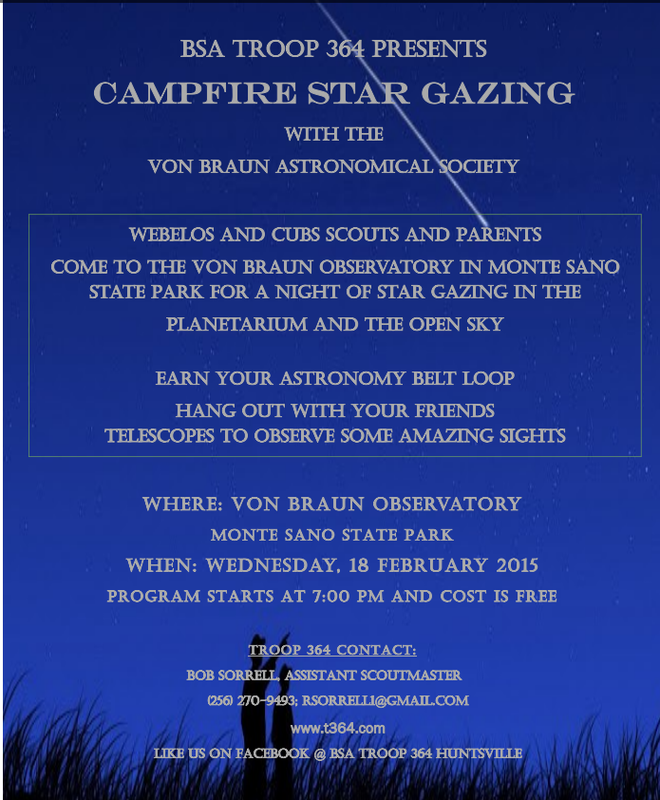 there will be a Webelos Campout on Monte Sano. The Court of Honor will be on September 16. Looking into October, our troop will be on a deep sea fishing trip in Destin, FL starting on October 3. Even more activities will be coming up as we go into Fall. We hope to see you all at our upcoming events and had a great start to the school year! Summer is here and our troop has many activities to keep you busy and having fun! We kicked off the summer this past weekend at Camp Westmoreland with our TLT. Tomorrow night, June 10, we have our summer Court of Honor which will include Eagle recognition. On Saturday, June 13, we have our annual cooking contest. In about two and a half weeks, from June 27 to July 4, we go to summer camp at Camp Crooked Creek (near Louisville, KY). Two weeks after that we have our canoe trip at Grimes Canoe Base in Tennessee (July 17-22). On July 22, we will have a troop pool party at one of our local pools. On August 8 we have a conservation drive and we end the summer at Stone Mountain and Six Flags in Georgia (August 14-16). The fun does not stop there. In September we have the Cub Scout Challenge at Ditto Landing and our Webelos camp-out on Monte Sano. In October, during fall break, we have a five day trip to Gulf Shores. We will camp at Gulf State Park and one of the days will be spent deep sea fishing. This is a trip for the whole family and will be from October 3 to October 7. We hope to see you at many of our activities and wish you a safe, happy, fantastic summer! The planned April camp-out for Savage Gulf has been switched to Buck’s Pocket from the 17th to the 19th. The weekend will be focused on advancement with a session on orienteering. Spring is finally here and so is spring break! That being said, our troop will still be active over spring break. This weekend, March 21-22, 2015, we will go on a mountain biking camp-out at Oak Mountain State Park in Birmingham, AL. If you do not want to bike or are not able to, don’t worry. You can hike or take advantage of the lakes and go fishing. With that being said, we will still have our weekly Wednesday night meeting. That night we will go over First Aid Merit Badge. We hope to see you at both events and hope you have a fantastic Spring Break! In the previous post, some outings were mentioned that we changed at TLT. In February, instead of going to Vicksburg in Mississippi, we are going to the Whitacre Farm to practice rifle and shotgun shooting. In April, instead of going to Shiloh Battlefield, we are going to Savage Gulf, a great place to hike in the mountains of Tennessee. We added one camp-out to the schedule that is very worth mentioning. Somewhere around mid to late October and early to mid November, the senior scouts (star and above) will go on a survival camp-out. Those are the schedule changes that arose at TLT. Happy New Year to everyone! It is now 2015 and there are many exciting events coming up. This weekend, we kick-off our year as a troop by doing a conservation drive on Saturday, January 10, 2015 at 8:00am. It will be very cold out there, so be sure to dress warm! Two weekends after that, we will have TLT (Troop Leadership Training) at Camp Maranatha, where we will plan out the year as well as other things. We will stay in cabins, so don’t worry about getting cold. In February, we go to Vicksburg National Military Park in Mississippi. In March, Oak Mountain in Birmingham for a mountain biking outing. In April, we will go to Shiloh Battlefield in Tennessee. And there will be other monthly camp outs. Some of our bigger trips will be Six Flags and Stone Mountain in Atlanta, summer camp at Camp Crooked Creek, a fifty mile canoe trip down the Buffalo River at Grimes Canoe Base, and deep sea fishing in Destin, FL. This just a glimpse of all of our upcoming activities. It will be a very exciting and busy year. If you want to be a part of what our troop does this year, come to TLT and help us plan out the year. This is the official announcement for the Troop 364 Christmas Party on Wednesday, December 17, from 6:30 to 8:30. Bring a dish for everyone to eat and a candy gift for Dirty Santa. The gift should be less than $5.00. It will be a night of fun.